This post from”Boiling Frogs Post” highlights the massive expenditure by the US government on warfare and related, (sometimes not), projects inside and out of the US. Hardly an example of responsible government, you might agree? 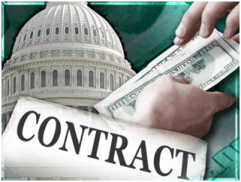 DOD spent $32,625,578,305+ on 181 individual contracts in February 2014 The Pentagon issues a jumbled list of contracts every business day around 5:00PM local time. Our project distills an entire month of these contracts into an accessible form. The Department of Defense (DOD) spent at least $32,625,578,305 on 181 individual contracts during February 2014. This entry was posted in Financial Crisis, Globalism, Human Behaviour, Justice, Politics, united states and tagged Barack Obama, Civiian Welfaree, DOD, Government expenditure, justice, united states, Warfare and Conflict. Bookmark the permalink. 3 Responses to US Department of Defence Spending – Should be of interest to All Americans. Unfortunately civilian control over government has vanished; Schools and universities promote falsehoods as consensus science.